Rachel Miller is not only a very experienced teacher but her unique combination of skills means she is a creative teacher - able to adapt her teaching to inspire students and encourage a love and joy of their instrument. 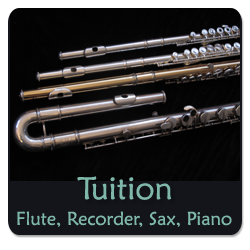 She has many years of teaching experience in schools, music centres and higher education - including the Saturday Morning Music School - SaMM in Totnes, and Dartington College of Arts, Devon where she was a specialist instrumental teacher in flute. She believes in giving students an excellent technical and musical foundation and brings to her teaching a wide range of experience in classical, jazz and folk traditions. Rachel Miller is a qualified music therapist and worked for many years in health and education services in Devon. These sessions for young children are not music therapy - in that theraputic aims are not being specifically worked on. Her goals are educational and aimed at helping children engage with learning. Music, in this way of working, can be very beneficial.The structures and elements of musical interaction use the same building blocks as our non-verbal communication.This kind of immersive learning can help children concentrate, engage, gain confidence as well as helping their communication. She is happy to work with children with autism, autistic spectrum, ADHD and other SEND needs. Sessions can also be tailored to help parents, teachers or support staff develop their own skills, resources and knowledge in music making with their child. Support and training for teachers. 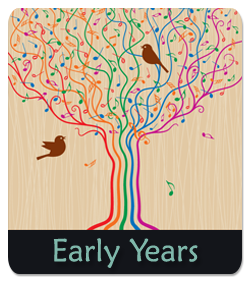 She runs one off sessions for early years teachers on how they can use music in their teaching - see Early Years section. No musical training or experience needed. By teaching and incorporating music through storytelling teachers are able very easily to bring the wonderful experience of music making to their students. Simple instruments that require no skill and simple techniques empower teachers. As a teenager Rachel played flute in the Northern Junior Philharmonic Orchestra, and was also a member of the National Youth Theatre. She studied at Oxford University and studied flute for many years with flautist Ingrid Culliford, Trinity College of Music, London. In 1991 she completed post-graduate studies in music at Dartington College of Arts, Devon. She has many years of teaching experience in schools, music centres and higher education - including the Saturday Morning Music School ( SaMs) in Totnes, and Dartington College of Arts, Devon where she was a specialist instrumental teacher in flute. As a musician, performer and teacher, Rachel has a wide range of musical experience including jazz, folk, classical, experimental and electronic music. She is a qualified Music Therapist and worked for many years in health and education services in Devon. Rachel is also a storyteller and composer. As a narrator and musician she has toured extensively with one of the UK’s foremost puppet theatre companies, PuppetCraft www.puppetcraft.co.uk. In her solo work she has developed a unique way of combining modern sound technology with poetic storytelling. She is a multi-instrumentalist and plays a wide variety of instruments live on stage which she samples live and builds up evocative textures of sound and music that conjure the images of the tale. See www.sonictales.co.uk for more information. She writes soundtracks for theatre and has released 2 CD’s of storytelling and music. Rachel has taught theory for many years and has developed a way of teaching theory that is very clear, fast and effective. Music Theory Zone is a combination of her teaching methods with online support - which includes musical examples - bringing theory to life. 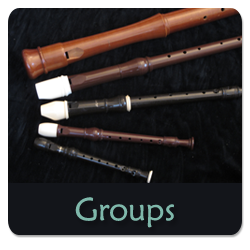 She also runs intensive 'Grade 5 Theory in One Term' courses - no prior theory grades needed. Hourly lessons £30 per hour.